Our friends over at Geringhoff had a chance to stop by and get a glimpse behind the scenes of what a day in the life looks like at our farm. Duane Hinchley and his wife Tina run a conventional dairy farm where they milk 120 purebred Holstein cows and operate over 2,500 acres in Cambridge, WI. Duane’s parents were the farm’s original owners and bought it in 1958. Duane grew up farming and began running the combine at age 12. You could say farming has always been in his blood. Duane and Tina tackle the dairy side of the operation as a team with Duane taking care of the feeding, nutrition, and breeding side of things while Tina handles everything involved with the intensive responsibility of daily milking. 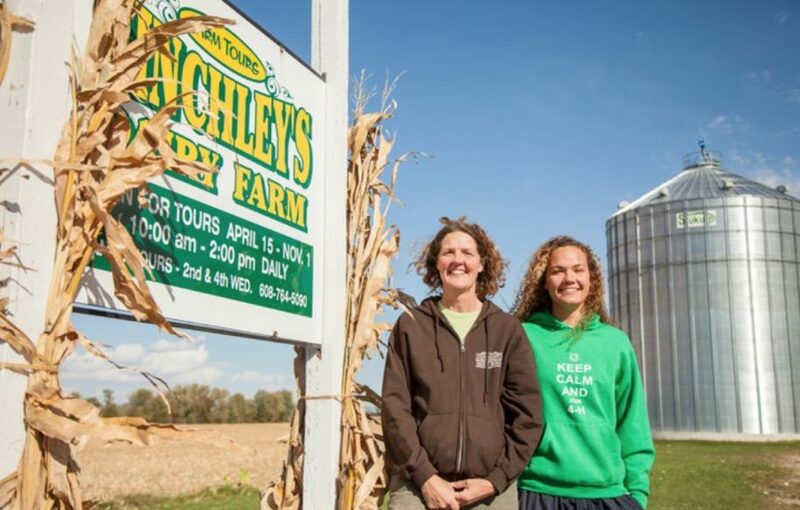 Tina also leads the charge on what most people know the Hinchley Dairy Farm for – its famous farm tours.